Amid a record-hot summer, the snow-capped peak of Kebnekaise mountain, Sweden's tallest, has lost several meters, thus losing out to its rocky northern twin; it's even projected to shrink further. The melting of glaciers amid scorching heat has resulted in a shift in Sweden's topography, allowing Kebnekaise's rocky northern peak to surpass its snow-covered counterpart, which has shriveled to become shortest ever, national broadcaster SVT reported. 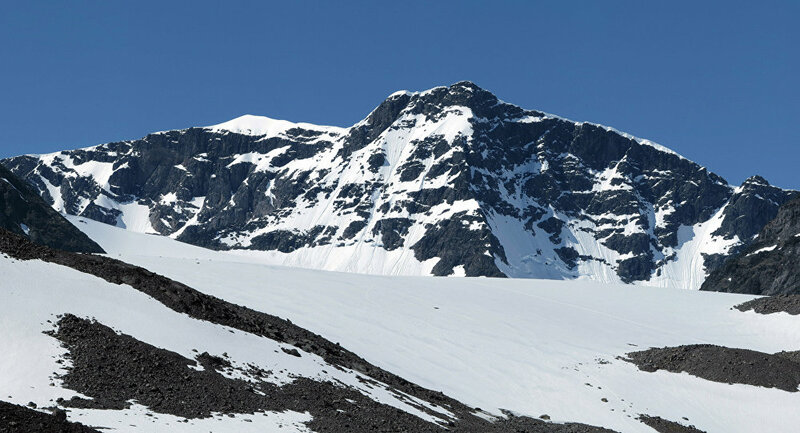 While Kebnekaise's rocky northern peak remains constant measuring 2,096.8 meters above sea level, the height of its southern peak tends to fluctuate depending the weather, forcing its glaciers to grow or recede respectively. Researchers have now confirmed that the southern peak of Kebnekaise has waned significantly, becoming shorter than ever before. Kebnekaise's southern peak now stands at 2,096.5 meters, 0.3 meters shorter than the northern peak. Last year, the difference between the two peaks was a solid two meters. Having lost four meters in July alone, Kebnekaise South is poised to shrink further, researchers predicted. "Normally the peak is at its highest in May and lowest in September, so one can expect it to shrink even more before the winter. The height of the southern peak varies by around three meters between summer and winter. In the long run the northern peak will become the highest year-round," Stockholm University wrote in a press-release confirming the shift. The mountain is measured using an optical angle and distance instrument, the same method researchers have been using for the past 35 years, with a margin of error of a mere ten centimeters. The earliest records available are from 1902 and the mountain has been measured every year since the 1940s. The recent topographic change is expected to tell on the country's tourism industry, as climbing Sweden's highest point, a popular destination, will become a significantly more challenging enterprise. Unlike its southern peer which is free for all, scaling the northern peak requires serious experience, a guide and proper climbing equipment. ​Kebnekaise is situated in Swedish Lappland, north of the Arctic Circle and west of the town of Kiruna, near the popular Kungsleden hiking trail. Sweden has had its hottest July in 250 years, with daytime temperatures repeatedly exceeding 30 degrees and beating out the climatic norm by 10 degrees, which has caused widespread forest fires even in its northernmost areas as well as massive rail closures across the country.